Can I just say that this is, in my skeptical opinion, one of the yummiest soups I have ever tried. And so easy to make, this soup made with Quinoa will be a real winner in your home, especially if you are a mushroom lover. 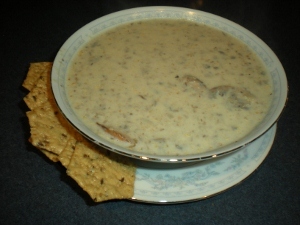 Perfect for those fall/winter evenings that scream out for a decadently creamy soup! Place the quinoa in a large, dry saucepan over medium heat. 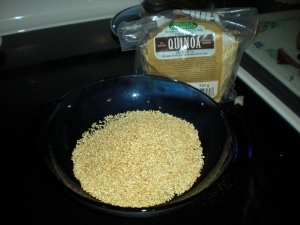 Toast the quinoa until fragrant, about 5 minutes, stirring frequently. 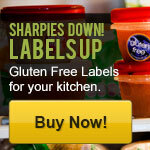 Place the quinoa in a bowl and set aside. 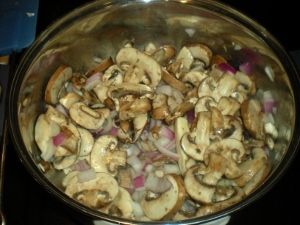 Melt the butter in the same large saucepan and sauté the onion and mushrooms until the onion is opaque and tender, about 7-8 minutes. 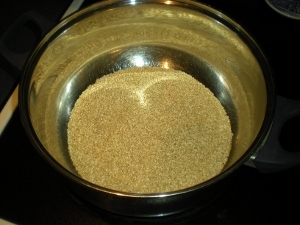 Remove 1 1/2 cups (375 ml) of the mixture and set aside. 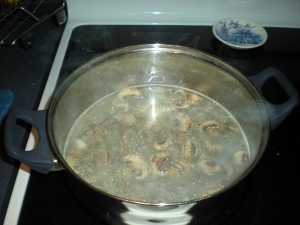 Add the toasted quinoa, stock and garlic to the saucepan and bring to boil. 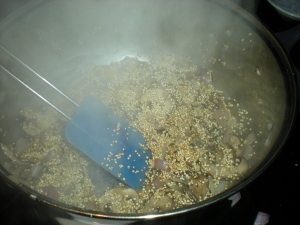 Cover, reduce to a simmer and cook until quinoa is tender, about 18 minutes. 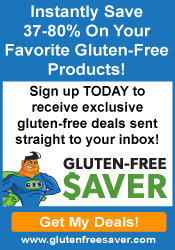 Pureé the cooked mixture with a hand blender or cool slightly and pureé in 2 batches in a blender or food processor. Return the soup to the saucepan. Season with salt and pepper. 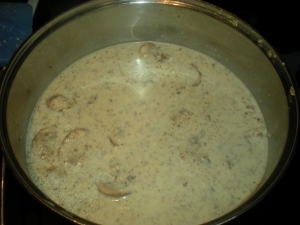 Add the reserved mushroom mixture and the 1 cup (250 ml) or cream. Reheat gently, being sure not to boil he soup. Garnish each serving with a drizzle of cream and some chives if you would like. Enjoy!